I love The Container Store. I recently had to buy storage for my magazine collection. I wasn't expecting for The Container store to have any green options, but they have a really stylish magazine holder made from 65% recycled post industrial material. The magazine holder is white with small round textured circles. Unfortunately, I don't know the name of it and it isn't for sale on The Container Store's website. But it is $11.99 and some of them have a sticked on them with the recycle sign. This modern collection also contains various other storage containers and boxes. The Container Store has other green options such as 100% recycled packing tissue paper, bulletin boards, and recycled gift totes among others. 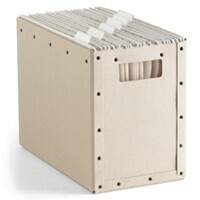 Seen above is their natural desktop file made from recycled fiberboard material. Very cool stuff if it doesn't have the lingering bad odor of waste products like most green products do..